One of my projects this easter was to give my home server an overhaul. The harddrives was running very low on kapacity and the Ubuntu server installation was beginning to be a nightmare to maintain. I choose to upgrade the hardware as well and then thrown in ESXi into the equation as well. The hardware centers around anÂ ASUS E35M1-M mainboard with an AMD Zarcate APU and a AMD Hudson M1 FCH. The APU has two cores, a TDP of mere 18W and has the AMD-V extensions. ESXi 4.1 does not support the board; the onboard NIC is not supported. The Samsung drives has a serious firmware bug. The E35M1-1 doesn’t have raid functionality, if you care about (some of) your data. The E35M1-1 board has an EATX 24pin power connector and my oldish antec cabinet/psu only has an ATX 20pin. All items can either be fixed or worked around, not to worry. I put the hardware together in my oldish Antec cabinet. I then used a standard $10 multimeter to verify that the 4 extra pins on the EATX connector on the mainboard (compared to a normal 20 pin ATX connector),Â was in fact hardwired/bridged to other pins on the mainboard. 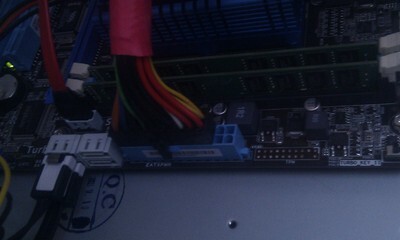 This bascially means, that a 20 pin ATX PSU will suffice for this board. After that, I obtained the firmware fix for the Samsung drives. It turned out, that I did not need it as drives manufactured later than December 2010 already contains the fix according to this post. You can download ESXi 4.1 for free. I did that. I burned the .iso file and booted from the CD. It booted the hypervisor, but complained/failed when I pressed F11 for installation. As guessed, it is due to the fact that the NIC, an RealTek 8111E is not supported. The fix is to include the realtek 8111E driver in the iso file, in two places: One place, used to include support in the installer. An one inside the ddimage, that the installer deploys onto the hardware. It is fairly simple if you know your way around linux. Instructions on how to build ESXi modules is on the net. For the lazy, you can pretty much get it served to you: an oem.tgz (local copy here) and a script called mkesxiaio (local copy here) that combines the oem.tgz and the ESXi installation iso. Download iso and oem.tgz and script. Run script and burn resulting iso file. 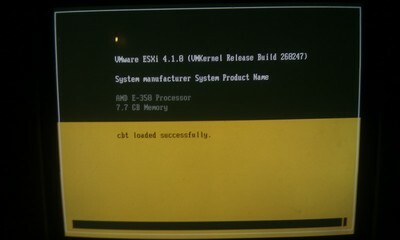 Boot that iso and install ESXi 4.1 onto the system. For me it worked flawlessly. After that I installed the ESX license key, provisioned an vm, installed debian 6.0 and migrated all my files to the new server. In the past I used to have a raid setup. The Hudson H1 FCH does not have raid support and neither does ESXi, except on selected raid controllers. Now what?